A Class will allow a user to define a group of variables and functions into one "instance". For example, a user may want to extend the functionality of the Tank and turn it into a complex CSTR. To do this, the user will need to define functions to calculate additional user variables. If the code is written without the use of class, the user will need to write the same code each time a CSTR tank is used. This can lead to repeating the same code a number of times depending on the number of CSTR tanks in the project. If the code is written in the form of a Class, the user can define all the CSTR Variables and Functions required as a "template", then instruct SysCAD to use this template to perform the CSTR calculations (n times) without the need to repeat the code. To aid the understanding of "Writing a Class" and to explain how to use the class function, a demonstration example project is distributed with the SysCAD install. Please see project Gold Project - CSTR pgm file. We will use this file to explain the use of Class in this document. The class declaration must begin with the Class keyword and end with the EndClass keyword. See Class Declaration. className : is an unique name of the class. In our example, this is called CSTR. Variables can be declared within the class, their scope is limited to the class, and they are available to the instance of the class. Append @ to make the variable visible in the Access window, but read only. For more information, refer to Variable declaration. Function, StrFunction can be declared, within the class and they are available to the instance of the class. The sequence of functions and variables within a class can be mixed and arranged as required. A very condensed extract of the CSTR Class PGM file is presented below to explain the structure and use of the Class definition, for the full PGM file, please see the Distributed Example project. The name of the Class (or template) is called CSTR. String tag "UnitTag" is defined here - the class uses the REAL SysCAD process unit tag when the actual calculation is performed. Using the Full SysCAD process unit tag inside the class is NOT recommended, as it will make the class not reusable. Function "Init" - initialises the class and substitutes the actual process name into 'UnitTag' when using the Class, explained in the next heading. Nested functions are allowed within a class, for example Function "CalculateCSTR" is called inside the Function "Exec"
In summary, the Class(template) "CSTR" contains a number of calculations and a number of Set Value Commands. Once the Class has been defined (template complete), the user can include this template in pgm files to perform calculations. Three CSTR instances are defined here, TankA, TankB & TankC. When the PGM file is evaluated during the SysCAD initialisation step, each instance of the Class is assigned a UnitTag Name. 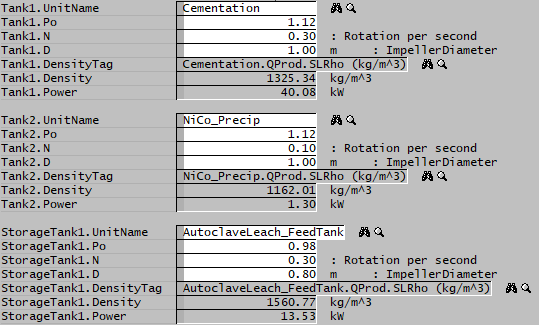 In the Gold Example Project, TANK_A, TANK_B and TANK_C are actual process unit tags. When the project is solved, at each iteration, the Exec() function is called for each of the CSTR instances. TankA.UnitTag - This is an example of the class variable. TankA.Exec() - This is an example of the class function. Four CSTR instances are defined here, Tank 0, Tank 1, Tank 2 & Tank 3. Note: The array always starts with 0, therefore, we have intentionally defined 4 instances here and we will use Tanks 1 to 3. The ExcludeWatch Keyword instructs SysCAD not to display Tank 0. In our PGM code we will skip Tank 0 and start with Tank 1. Tank.UnitTag - This is an example of the class variable. Tank.Exec() - This is an example of the class function. NOTE that this file must NOT contain the $ sign or EndFile token at the end of the file. For shared use in a single project - The class definition file can be stored in the project\controls folder, then inserted into other PGM files using include file syntax >>filename. If the class definition file is stored in the same folder as the PGM file, then use >>General_Classes_and_functions.pgm to insert the file as needed. For shared use across multiple projects - The include file can be saved in a common shared folder, then inserted into other PGM files using include file syntax >>filename, the file name needs to be the relative or full path name. The user wants to calculate the required agitator power in a number of vessels in a project. This functionality will be used in a number of different projects, and hence the file with the class will be stored on the network where it can be accessed by a number of users and projects. Density - Density of the material in the vessel. The user may follow the same rules for individual functions that may be useful in a number of pgms or in separate projects. Gold Project - demonstrates the use of Classes in the CSTR pgm file. This is used to calculate the gold and copper leaching and adsorption values in a number of individual tanks. See Example Class Files for some example uses of user specified class definitions. Species Database Class This class gives access to information about species and phases within a project. For example, users can obtain species Density, Saturated Temperature or Pressure, number of solid species in a project, etc. Particle Size Definition Class This class gives access to information about the Particle Size Definition (PSD) within a project. For example, users can find the number of Size Intervals in a PSD, the Top and bottom Size, etc. Array Class This Class lets user define an array to read or store numeric values. StrArray Class This Class lets user define an array to read or store (in memory) string values. Matrix Class This Class lets user define an matrix to read or store values. TimeClass This Class contains some function to manipulate the time readings. Tag Select Class This Class provides a function to retrieve a list of model tags meeting a SQL type select query, similar to the Excel Tag Select Reports. Plant Model Class This Class provides a function to retrieve a list of global tags available in the plant model, can be used in PGM or MP files. NOTE these two classes have been converted into SysCAD models, users can use the Insert Unit operations to insert them onto the flowsheet. Noise Class This has been implemented into SysCAD as the Noise Process unit. This page was last edited on 19 September 2018, at 01:49.